SuperNova's True Font technology looks beautifully smooth even on the largest displays. Magnify text and images from 1.2 all the way up to 64 times. And because everyone's eyesight is different, magnification comes in 28 sizes so your users can find a perfect fit. Zoom in and out as much as needed with a touch of a key or spin of the mouse wheel. Choose from 24 carefully designed colour schemes each designed to reduce glare and maximise your comfort while reading. Alter the appearance of colours on your screen, preserving the original document colours for printing. Or users can make their own scheme by adjusting brightness, contrast or colour tint. Colour Replace can swap colours to show only the shades that users recognise, making reading web pages easy again. Mouse pointers which are easy to see but keep out your way. Users can choose from 4 popular mouse pointer colour schemes or create their own scheme to make the mouse pointer easy to see. Set the pointer size independent of your magnification level so text is never hidden by the mouse. With over 200 pointer images included, the mouse pointer has never been so flexible. Get more done with multiple monitors. 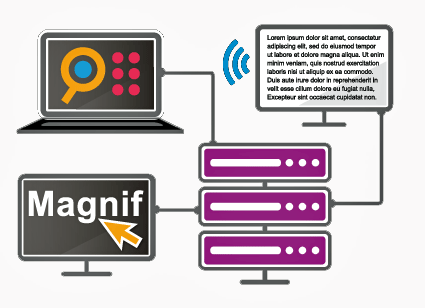 Magnify on one, two or as many displays as required. Multi-task with each magnified document on separate screens; project presentations original size to sighted audiences keeping speaker notes magnified on your laptop; users can also work closely with a trainer or colleague who can follow a clone of their display, but at regular size. Read from Here is for when users simply want to have a document or web page spoken in its entirety. Start and stop reading with a single keystroke or mouse click. 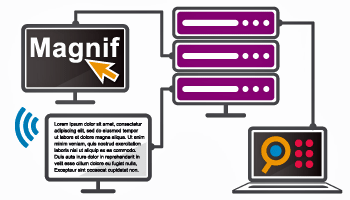 As the text is spoken, the current word and line is highlighted visually - ideal for sighted trainers or users with some sight. Item Finder speeds up navigating complex documents and web pages by listing: Links, Headings, Objects, Tables, Revisions, Comments, Spelling Errors, Controls and ARIA Landmarks. Text style information is announced so users can check their documents look great. Fonts, sizes, colours, bold, italic, underline, subscript and superscript changes can all be reported. Verbosity tells users about the types and states of over 60 kinds of control as they tab and arrow around web pages, Windows and app dialogs. Hear if checkboxes are checked. Hear the position of sliders. Hear if links have already been visited. Users that are just getting started can choose High Verbosity and SuperNova will remind them which keys to press. Choose from 4 built-in verbosity schemes or take ultimate control and create your own verbosity. Braille users can choose speech and Braille verbosity independently of each other. Monitor Markers announce changes occurring elsewhere onscreen away from the cursor. Security notifications appearing in your web browser, file download progress, when the other person in an instant message conversation is typing a message, Monitor Markers will cause SuperNova to speak automatically. If your user doesn't want to hear these notifications they can toggle Monitor Markers off. Licensed by user, not by device. Bandwidth usage is optimised as all speech audio is generated on the client machine and is not streamed across your network. Not all applications are accessible and for visually impaired employees may result in reduced productivity, frustration or total inaccessibility. Dolphin’s scripting service can remove these barriers by creating a bespoke 'script' that ensures your proprietary or third party applications are seamlessly speech and Braille compatible. Talk to our sales team to review your applications’ accessibility. Included with SuperNova Enterprise is direct access to Dolphin’s 1st line product support team, as well as advanced support tools for troubleshooting. 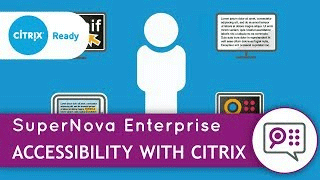 Authorised dealers for SuperNova Enterprise have been chosen for their expertise in both accessibility and Citrix and Remote Desktop Server environments. Onsite installation support is also available upon request for an additional charge.